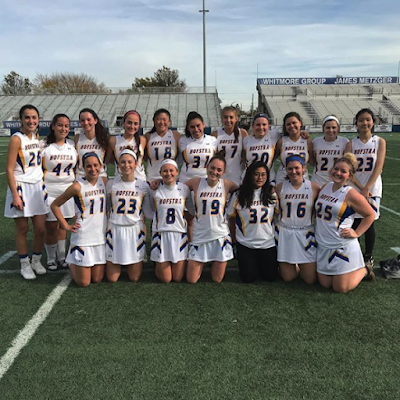 Women's Club Lacrosse hosted New York University at Shuart Stadium at Hofstra University on Saturday, November 4th. Zoe Szczotka led all scorers with five goals and one assist, Jessie Allendorf tallied three goals, Mikayla Ruthig had two goals, and Amanda Zaino and Emily Conti both added goals as well. Alexis Lott won nine draw controls and added an assist, Linnea Barbour recorded four ground balls with one assist and the Pride came away with the 12-8 victory behind solid goaltending from Maria Lao. Club Softball hosted the University of Massachusetts on Sunday, November 5th for a triple-header at Bill Edwards Stadium at Hofstra University. The Pride came away with the a victory in the first game by a score of 9-4. Due to weather, the second game was shortened and the Pride lost 4-3. The teams will make up their third game at a later date. Club Billiards competed in their weekly match on Sunday, November 5th at Raxx Pool Hall in West Hempstead, New York. Timothy Murphy and Steve Jacobovitz both posted shutout victories and Colin McGuire added a solid victory as well. The team won their match, 8-5, and stand atop the standings in their league. Club Powerlifting ventured to Newark, New Jersey on Saturday, November 4th to compete in the Revolution Powerlifting Syndicate’s Autumn Apocalypse powerlifting competition. Jamie Zimmerman had a new squat personal record (PR) of 255lbs and a new deadlift PR of 305lbs. Club Equestrian competed at the Olde Towne Equestrian Center in Selden, New York on Sunday, November 5th. Kate Milford placed 6th in novice fences and second in novice flat. Katie Rozek placed 5th in novice fences and 4th in novice flat. Petra Srnec placed 2nd in novice fences and 1st in novice flat. Hannah Matuszak placed 5th in advanced flat class. Julia Shalov placed 2nd in beginner flat class. Maya Palmer placed 6th in walk/trot. Club Roller Hockey played at Skate Safe in Old Bethpage, New York on Saturday, November 4th and Sunday, November 5th. The D4 team had a solid weekend, finishing 3-2. The Pride came away with wins against Vermont, Niagara and Stony Brook. Ryan McCallen led the team in goals (7) and points (9). The D2 team didn’t fare as well, going 0-2-1 on the weekend. Nigel Grove led the team in points (5) over the 3 games. Club Quidditch hosted their Big Apple Quidditch Conference tournament on the Intramural Fields at Hofstra University on Saturday, November 4th. 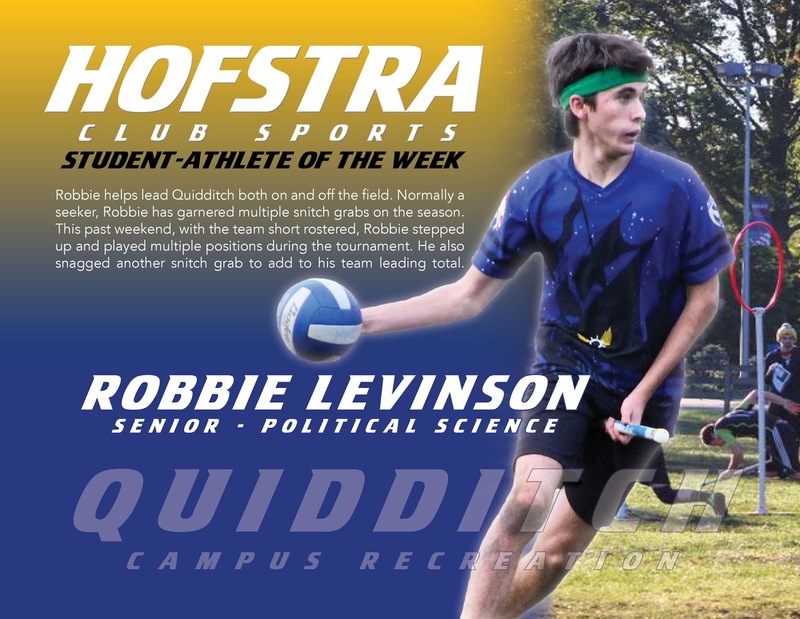 Hofstra went 1-2 on the day beating the New York Pigeons by a score of 190 – 90 with Robbie Levinson getting the snitch grab. Women's Club Ultimate Frisbee traveled to New Haven, Connecticut on Saturday, November 4th and Sunday, November 5th to compete in the Coffee Cup Tournament at Yale University. Despite several close contests, Hofstra was only able to manage a 2-5 record on the weekend. The team is looking forward to improving during practices and conditioning moving into the spring semester. Club Rowing traveled to New Rochelle, New York on Sunday, November 5th to compete in the Women's Varsity 4+ and Men's Novice 4+ races. The team competed hard and are looking to continue their success next semester. Club Rock Climbing took to The Cliffs at Long Island City for their weekly climb on Saturday, November 4th. The team enjoyed the various, fun and challenging routes. Robbie helps lead Quidditch both on and off the field. Normally a seeker, Robbie has garnered multiple snitch grabs on the season. This past weekend, with the team short rostered, Robbie stepped up and played multiple positions during the tournament. He also snagged another snitch grab to add to his team leading total. Congratulations to Robbie!